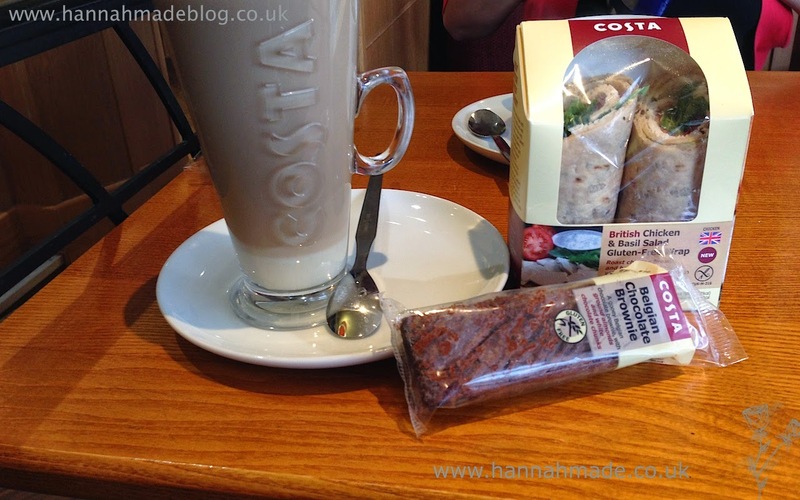 Last week I went to Costa Coffee to have a gluten free lunch. For celiac awareness week Costa released a gluten free wrap. So I had to give it a go. My lunch consisted of a decaf skinny vanilla latte, a gluten free brownie and the chicken wrap. I was honestly surprised I managed it all! I was so excited by this wrap and it did not let me down! The actual wrap is very much like the a gluten free warburtons seeded wrap which I really enjoy, they are a lovely texture and not at all dry. This wrap has a good amount of filling, it consists of chicken pieces, rocket, tomato and basil mayonnaise. The flavour is very fresh but is also very filling, it is a perfect summer wrap as it is not to rich on a hot day (if we see one!) like many of the other types of 'regular' toasties they do. I found this wrap very enjoyable and would fully recommend it. I have had the cherry bakewells many times in costa but I have never tried the brownie, my reasoning was purely because many places sell brownies near me. But I felt in the mood for one! And I am glad I did, this is the best brownie I've had so far, many I've tried are enjoyable but either leave a slight aftertaste or a slight dry feeling in the back of the throat, which this one did not. This brownie also had chocolate chips in it which I believe helps with the moistness of the cake. Overall I really enjoyed this brownie and feel that even people who are not gluten intolerant would enjoy it. Have you visited a costa recently? The Fight of the Bakewell Tarts!